Notice anything different about your orange juice lately? Several major producers, including Tropicana and Florida’s Natural, shrank their containers from 59 to 52 ounces in the past year, a 12% decrease, without lowering prices. It wasn’t so long ago that a carton of OJ contained 64 ounces. Downsized products are nothing new—food makers have long known that supermarket shoppers are more likely to take note and change brands when prices increase than when package sizes decrease, so that’s become a common way to boost bottom lines. But Tropicana was especially sneaky with its recent downsizing, switching to bottles that are narrower front to back but just as tall and wide as before, so they appear as large as ever through the supermarket cooler door. The quantity of juice in the container is hidden in small print at the very bottom of the label. The makers of breakfast cereals sometimes use the same trick by shrinking boxes, making them narrower from front to back, the dimension most difficult to judge when the product is on store shelves. Meanwhile, Hershey’s is replacing its soft plastic bags of individually wrapped chocolates with stand-up pouches. The candy is the same, but the amount in each package reportedly will decrease, boosting the price per ounce. 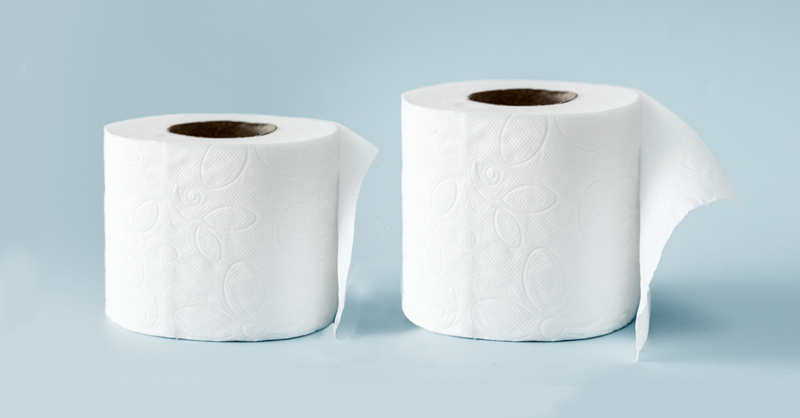 Over the years, toilet paper and paper towel makers have practiced a sneaky trick of their own. They don’t just reduce the number of sheets per roll—as Bounty has done, for example—they reduce the dimensions of each sheet. Example: Scott toilet paper has boasted “1,000 sheets per roll” for many years. But the size of each sheet slowly shrank from 4.5 inches square to 4.1 x 3.7 inches now. Consumers get 25% less toilet paper. Other product categories that tend to see more than their share of ­sometimes-sneaky product downsizings include coffee, ice cream, peanut butter, yogurt, toothpaste and shampoo. What to do: Periodically compare the per unit, per ounce or per square foot price of the products you buy with those of competing products—even if the overall price is the same as ever. Be especially careful to do this when a product’s packaging boasts of a new version, flavor, formula or some other improvement—manufacturers often make claims like these to distract from or explain away a smaller size.